Some of the celebrity tomatoes had blossom end rot so I plucked them off. Symptoms may occur at any stage in the development of the fruit, but, most commonly, are first seen when the fruit is one-third to one-half full size. As the name of the disease implies, symptoms appear only at the blossom end of the fruit. Initially a small, water-soaked spot appears, which enlarges and darkens rapidly as the fruits develop. Large lesions soon dry out and become flattened, black, and leathery in appearance and texture. Since it is of a physiological nature, fungicides and insecticides are useless as control measures. 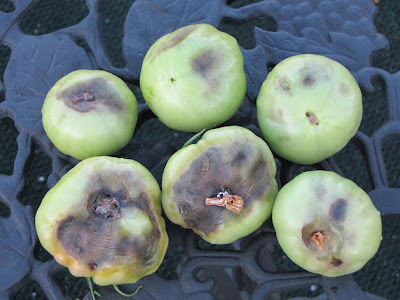 The occurrence of the disease is dependent upon a number of environmental conditions, especially those that affect the supply of water and calcium in the developing fruits. The disease is especially prevalent when rapidly growing, succulent plants are exposed suddenly to a period of drought. When the roots fail to obtain sufficient water and calcium to be transported up to the rapidly developing fruits, the latter become rotted on their basal ends. For the past couple of weeks I've been able to get away with filling their 4 gallon tank every other day, obviously that is no longer the case. These are some thirsty plants! Now, when I get home at the end of the day, there's barely an inch of water left in their reservoir. I miss the rainy days of June when I had to water only once or twice a week. Oh man. I've dealt with the heartbreak of blossom end rot before. It means they need calcium. This year I tried to stave off BER by putting crushed eggshells in the peat pots that I used to start the tomato seeds. Good luck! BTW, For the fruits with only minor BER, I would sometimes cut off the bottom end and use the rest of the fruit to make fried green tomatoes. That way I felt that all was not lost! This is my only tomato problem. I don't have reservoir planters, which I would have thought would spare them due to the supposed constant water. I now suppose not! I find it hard to keep vegetables watered in a city life. Theres always something pulling me away from constant tending. Mulch the pots! I've mulched with cypress since it is the brightest, and I've found that I don't need to water everyday, when it's under 90. Plus wood mulch holds in water as well - so that can be a help - just don't get any of that dyed mulch. You might throw a bunch of eggshells and banana peels under the mulch, to reduce the nitrogen deficiency that mulch first presents. And you might consider painting dark containers with the white plastic paint to reduce heating via the container. I never had that experience with tomatoes except for wilting... I guess crushed egg shells should help.. But the release of calcium into the soil will be very slow by the shells... I will give LIME a try.. I write so much about tomatoes maybe I should create a new blog devoted entirely to their care. What I forgot to mention in this post is that most of these tomatoes were pulled from only one of the plants. It's hard to tell from the plant update pics, but one of the celebrity tomato plants is slightly smaller than the other. I think this smaller plant is losing out to the bigger plant in the competition for resources. I had a similar problem last year when I planted a bushy roma with a tall cherry in the same container. The roma did not recover until I pulled out the cherry. I don't eat a lot of eggs so I'll try some lime and see if that helps. We are having the same problem with the tomatoes we are growing on our deck in Philly. My husband likes to say that we are growing "tomacco" (a Simpson's reference). I am going to try some lime and eggshells also, and see if that works! I actually just wrote about this too... Had to throw away four huge heirloom tomatoes--SO PISSED! At least it's not blight (fingers crossed).